The Flash -- "Cause and Effect" -- FLA321b_0126b.jpg -- Pictured (L-R): Carlos Valdes as Cisco Ramon, Candice Patton as Iris West, Keiynan Lonsdale as Kid Flash, Grant Gustin as The Flash, Jesse L. Martin as Detective Joe West, Anne Dudek as Tracy Brand and Tom Cavanagh as Harrison Wells -- Photo: Katie Yu/The CW -- ÃÂ© 2017 The CW Network, LLC. All rights reserved. We learn tonigh how Savitar came to be and I found the explanation to be somewhat confusing. I think the gist is that Savitar is a time remnant that Barry created to defeat Savitar and the only one to survive because he was necessary to create Savitar. The Flash — “Cause and Effect” — FLA321b_0337b.jpg — Pictured (L-R): Grant Gustin as Barry Allen and Candice Patton as Iris West — Photo: Katie Yu/The CW — ÃÂ© 2017 The CW Network, LLC. All rights reserved. Barry explains to Team Flash who Savitar is and Cisco realizes what the Legends message from 2056 Barry meant. Team Flash then figures that the only way to stay ahead of Savitar is to erase Barry’s short-term memory. The reasoning is because Savitar is Barry, he remembers everything that Team Flash does. So to stop Barry from knowing what Team Flash is planning to defeat him they will tinker with his brain chemistry. Joe thinks it is a bad idea that Cisco and Julian is tinkering with Barry’s brain and thinks Caitlin would be better. Cisco and Julian think they are up to the task but unfortunately, Joe was right. Instead of eliminating Barry’s short-term memory, they have given him amnesia. It is actually quite comical seeing Barry not remember anyone and how he prefers to be called Bart rather than Barry. To make matters worse, Cecile needs Barry to testify against an arson named Heat Monger who is the worse arsonist since Mick Rory disappeared. When Cecile finds out that Barry has amnesia she tells Joe that if Barry can’t testify, Heat Monger will walk. Meanwhile, Iris and Barry get to know each other again. Iris sees how light hearted and funny Barry is when he no longer has the weight of the world and his dark past haunting him. Iris comments to Barry how nice it is to see him smiling. Their moment of levity is cut short when Barry gets called to the courthouse to testify. Cisco and Julian provide Barry with a pair of teleprompter glasses where Julian types out Barry’s answers to Cecile’s questions. It is quite funny but unfortunately, Barry sweat short circuits the glasses and he can’t provide expert testimony so Heat Monger walks. Elsewhere, Killer Frost goes to Savitar and wonders what is up with him and we see that Savitor has lost his memory too. When Iris and Barry return to their apartment, the two share a kiss that seems to have sparked Barry’s superspeed (he had forgotten he was the Flash). Barry is amazed at his powers and is all excited when he returns to STAR Labs with Joe and Iris. However also at STAR Labs is Killer Frost who has come to Team Flash with a proposition. When Wally tries to stop Killer Frost he realizes he doesn’t have his powers. It seems that when Barry lost his memories it resulted in Savitar losing his memories. Because Savitar has no memory, he doesn’t offer Wally his speed that he had in Flashpoint. The Flash — “Cause and Effect” — FLA321a_0085b2.jpg — Pictured (L-R): Keiynan Lonsdale as Wally West, Danielle Panabaker as Killer Frost and Tom Felton as Julian Albert — Photo: Jeff Weddell /The CW — ÃÂ© 2017 The CW Network, LLC. All rights reserved. Team Flash decide to work with Killer Frost to work on a device that gets Barry’s memory back as she needs Savitar’s memory to return too. Cisco starts sharing memories of working on the particle accelerator with Julian. Cisco tells a story about Ronnie getting frustrated while working on it and Caitlin completes the story. Cisco tries to appeal to Caitlin and their friendship but she only wants to complete their task. 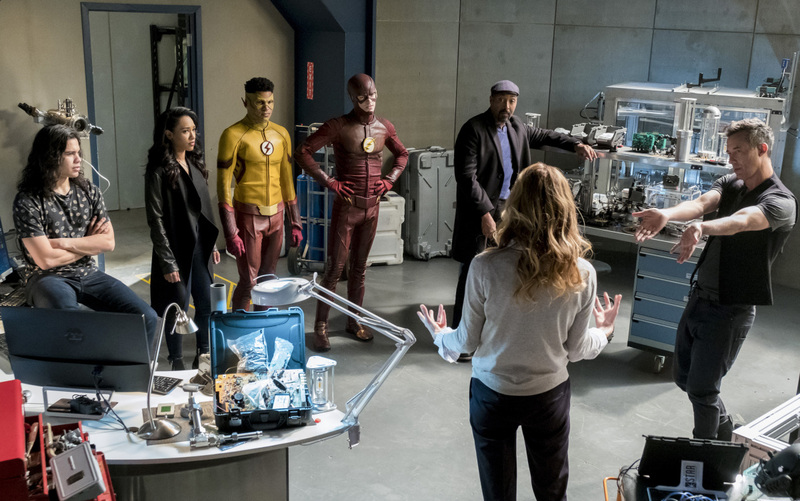 The Flash — “Cause and Effect” — FLA321a_0646b.jpg — Pictured (L-R): Danielle Panabaker as Killer Frost, Tom Felton as Julian Albert, Candice Patton as Iris West, Jesse L. Martin as Detective Joe West, Carlos Valdes as Cisco Ramon and Keiynan Lonsdale as Wally West — Photo: Jeff Weddell /The CW — ÃÂ© 2017 The CW Network, LLC. All rights reserved. Because Heat Monger was let loose, he goes back to his arson ways and torches an office building. Team Flash sees the news reports and Barry believes he is ready to be the hero despite his memory loss. So the Flash runs to the scene awkwardly but he doesn’t know what to do. Cisco and Julian are forced to use the device they developed with Killer Frost but it initially doesn’t work. Killer Frost tells them it did work but he needs someone to jog his memory. Iris shares with Barry how he came to stay with the West’s and her memory of how she found Barry crying on his first night with them. Iris tells Barry it was the moment they fell in love and how they would always be there for each other. This jolts Barry’s memories and he remembers as does Savitar. With everyone’s memories back, the Flash and Kid Flash put out the fire. Killer Frost goes to leave and Cisco, Barry and Julian try and get her to stay on Team Flash. Killer Frost isn’t interested. Julian tells Caitlin that he will figure out how to fix her and that he loves her. Killer Frost coldly tells Julian that she doesn’t love him nor does she or has ever loved Team Flash. But we see Caitlin briefly return before Killer Frost takes over. The Flash — “Cause and Effect” — FLA321b_0015b.jpg — Pictured (L-R): Tom Cavanagh as Harrison Wells and Anne Dudek as Tracy Brand — Photo: Katie Yu/The CW — ÃÂ© 2017 The CW Network, LLC. All rights reserved. While all that was going on, HR was tasked in motivating Tracy in completing the Savitar trap that they both name the Speed Force Bazooka. Throughout, we see the crackling chemistry between the two that leads to a kiss. This kiss does spark something in Tracy and she has the missing piece she needs to complete the Speed Force Bazooka. When Tracy tells Team Flash that the trap is complete but the get it to work it requires the power of the sun. Barry and Cisco realize where they can get such an energy source that somehow involves King Shark.